I know, I know...this topic probably sounds like it has nothing to do with you or your fitness goals. Am I getting too 'technical' on you? Well deal! Because you need to know about 'getting more alkaline' and getting out of an acidic and toxic and inflamed state. So take a few minutes out of your day and read on. (Next post will be about the 'constricting' and 'expanding' properties of food, I promise). Blood pH Level ranges from low pH (acidic) to high pH (alkaline). Our body fights to keep our blood pH level between 7.35-7.45 via its internal regulating systems. If the blood pH dips below 7.35 it turns too acidic (acidosis) and above 7.45 too alkaline. So why do I care about this? "A diet rich in alkaline foods help reduce inflammation in the body...chronic inflammation can negatively impact your health. Experts seem to agree that one of the first ways to reduce inflammation is by assessing your diet and adding in alkaline foods and removing the acid ones." While, it's said that acidosis leads to diseases, brain fog, poor mood, irritability, poor digestion, low energy, excess weight, aches and pains and it is said that cancers thrive in an acid state...so this is why pH is so important. Once I got the acid-forming products out of my life, my quality of life improved, do you want to improve your quality of life? So, what do you do? 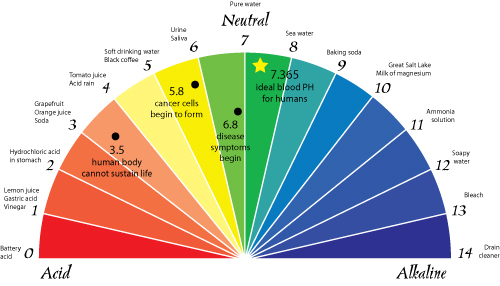 Counteract acidity by consuming foods that bring your pH up to the alkaline side of the scale. The average western-diet is acid-forming. Coffee, animal meats, poultry, fish, eggs, dairy, bread (even whole wheat), pistachios, peanuts, butter, margarine, artificial sweeteners, sugar, beer, liquor, wine, canned food, microwaved food, processed foods are all foods to stay away from because they are highly acidic! Click this link--> Look on the internet for a chart of acid-alkaline foods. Almost all vegetables are GREAT for you and alkaline forming, fruits are to be eaten in moderation. Fruits that are alkaline forming are avocados, fresh lemon & limes. Almonds, sunflower seeds, pumpkin seeds, flax seed, and sesame seeds are alkaline forming too. Flax seed and Olive oil are alkaline. Get a pressure cooker, and start cooking up your grains and beans/legumes from their whole and untouched/unprocessed states. Such as whole buckwheat groats and lentils which are on the alkaline side of the spectrum. Again, look up a chart online and make note of what is acid and alkaline forming. You may read this and say to yourself that getting rid of these 'foods' or changing the way I eat to be more 'alkaline' would be too difficult. But let me ask you this, "is there not more to life than the food we eat and the clothing we wear...?". The food you eat should be the fuel to power you through your day! Is it not harder to go to the gym, stick to your exercise routine 100% day-in and day-out and not see results because you haven't changed your diet in a way to align with what you want to achieve with your health and fitness? Is it not absolutely frustrating when you feel like crap when you wake up in the morning, and you have a whole day ahead of you of work and errands and life to deal with? Wouldn't you like to wake up and feel ready to take on the day? Sleep better? Feel energized after a meal instead of tired and weighed down? Walk out your door, look up at the sky and see 'true blue' for the first time? Be so clear-minded and on-point that you tackle work stress, work problems and work duties like you've never been able to before? Shed excess weight that you can't seem to lose no matter what exercise routine you do, no matter how many minutes you walk/run a day, no matter how many spin classes you do, or crazy starvation diets you put your body through? YOU CAN achieve optimal wellness, YOU CAN experience a better quality of life, it all depends on whether you MAKE THE COMMITMENT TO, whether or not you decide that you're fed up with feeling like crap everyday and you decide that you're ready to make the changes you need to make to achieve your goals. We all hit rock bottom at some point, but if I were you I'd start before I hit rock bottom. Once I learn something, I implement it into my life in a way that will make a positive impact on my well being. How can you learn something that is life-changing and not use that new information in how you live your life? Many people out there read about and learn things that could make a positive impact on their well being and the environment, yet they just move on and don't do anything about it, they are numb, maybe they're scared, maybe they haven't hit rock bottom yet. Don't be numb, don't wait until you hit rock bottom, don't wait until you get some horrible health diagnosis from your doctor, you were given life...one life...to be ALIVE, feel ALIVE and see 'true blue'! Disclaimer: I am not a nutritionist or a doctor. What I write in my blogposts is simply information that I have gathered over the years from reading and researching several health related topics from credible resources as well as personal experiences. I urge you to consult with a physician before changing your diet. The purpose of my blogposts are to share my experiences and fitness knowledge with everyone I possibly can to help others in their journey to improve their state of well-being.